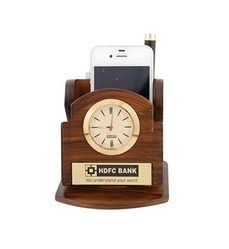 Prominent & Leading Manufacturer from New Delhi, we offer wooden desktop clock, wooden desktop product with ganesha, wooden pen stand, wooden table top pen stand, wooden top with mobile holder and multipurpose pen stand with watch. In order to fulfill the diverse requirement of esteemed clients, we are offering a comprehensive range of Wooden Desktop Clock. This desktop clock is aesthetically designed by our affluent craftsmen utilizing excellent quality material as per the contemporary trend of market. The offered desktop clock is made available in various designs and sizes to suit demands of customers. 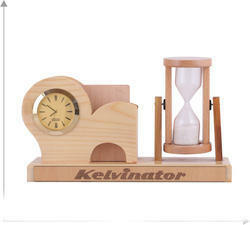 Also, we are giving this desktop clock to customers within a given time frame at affordable price. 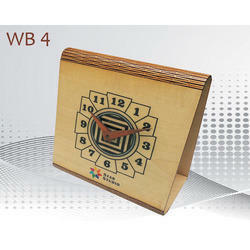 To beat the competition and stand tall in the market, we are engaged in offering a wide range of Wooden Desktop Clock. The offered desktop clock is designed by our experts using best quality material in complete compliance with quality standards. This desktop clock can be also customized by our professionals in various designs and sizes as per customer’s choices. The offered desktop clock is preferably suited for keeping the pens. 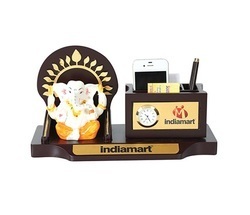 We hold immense expertise in manufacturing and supplying a broad range of Wooden Desktop Product with Ganesha. Widely used in corporate world, this wooden desktop is designed from the innovative techniques & finest quality of material as per the trend of market. The offered wooden desktop is also customized as per the needs of our patrons. As well, the offered wooden desktop brings an aesthetic and stylish look to the interior of the office space. Wooden Pen Stand made up of wood. 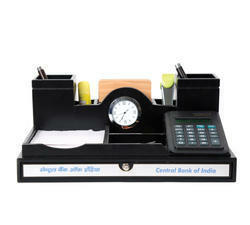 We are manufacturer of pen stand and customized as per your requirement. Are you fade up with your messy desk, we bring you an ultimate option that will not add style to your working desk but will also help you to keep your desk clean and tidy. 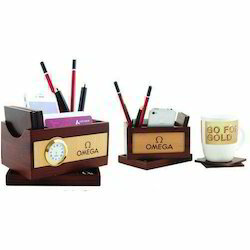 Wooden Pen Stand can be used on the study table, office desk, working table anywhere. Place this pen stand where ever you want to. This exclusive pen stands comes with a watch which also helps to keep track on time. 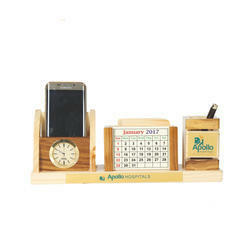 Pen Stand Made up of Wood andwe are manufacturer and customised as per Requirement. 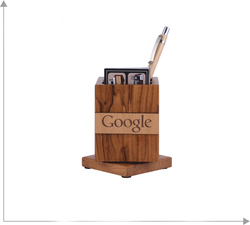 Our company excels in offering Wooden Top With Pen Stand to the clients. Wooden Table Top With Pen Stand is made keeping in mind the diversity of requirements of the customers. This product is used for gifting purposes. This product is made by using quality tested allied material and latest technology in set quality norms. This product is available in plenty of sizes, designs and shapes as per the different requirements of the valuable clients. Offered range is widely appreciated by the esteemed customers for characteristics like proper finish, attractive look and unique design. 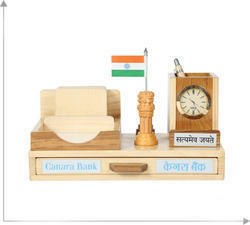 With firm commitment to quality, we are offering a broad assortment of optimum quality Wooden Top With Mobile Holder. We manufacture the offered range of wooden desktop organizers using excellent quality wood, which is sourced from the reliable vendors of the market. To meet the diverse requirements of patrons, we are offering these wooden desktop organizers from us in various designs, sizes and other specifications. 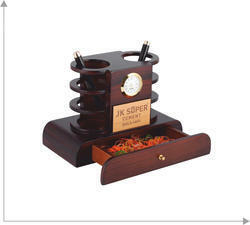 We are supplier of Multipurpose Pen Stand with Watch. Replace your old pen stand with this new Revolving Pen Stand which can be easily revolved, rotated the way you want to. These pen stands are very spacious and is divided into sections for pens, note pads, etc. These pen stands not only look elegant, classy but quality wise are also good. Apart from manufacturing these pen stands, we are the supplier and traders of this product. We are offering Wooden Multi-User Pen Stand.